Hi, it's Colette here, and this week it's my turn to set the Polkadoodles challenge - as my 'baby' will be turning twenty one next weekend, I thought it might be a good idea to get everyone to make an age card. I have already made a couple of cards for my daughter for other people to give to her, but am looking for some inspiration for my own, so I am depending on you all to show me lots of fabulous creations! The challenge is open until Sunday 9 October at 12noon GMT and any entries that do not follow our challenge rules will not be eligible for any prizes so please read them carefully! Ruth: I've made a cute card for a little girl who will be 2 at the end of November! I've used the bear template from Paper Boutique Vol 3 and printed the A5 size, layered it all up and added some pink ribbon from my stash. The number 2 is a die cut from my stash. Audrey... For this number card I used the CD All Around And Everywhere. I colored the owl stamp in with Copics and used my Cricut for the banner and the number. The letters are stickers and I stitched around the edges with white floss. 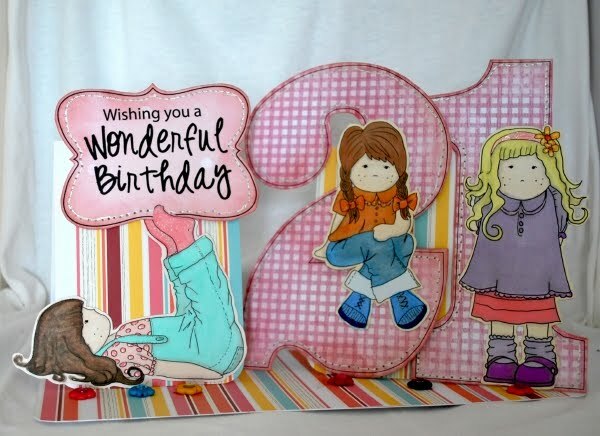 Fliss - My younger daughter and her circle of friends will all be turning 21 over the next few months so I decided to get ahead with my cards. 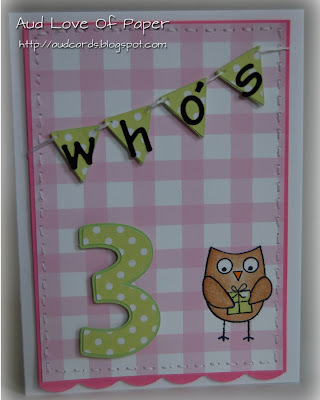 I used the gorgeous Winnie theme numbers and some pretty stitched paper together with a lovely sentiment panel from the A Double Sprinkle Of Kraft CD. The pink border is a scrap of paper from The Sundae Of Seasons CD and the pretty butterfly by Hobby Art was coloured with Promarkers. Louise- I have used the All around and everywhere CD for the papers that I have used on my card and the image is a S.w.a.l.k stamp called Day dream believer. Lis-m . Today I used papers from the new Pretty Sweet Cd.. 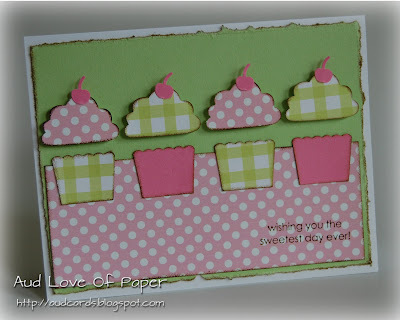 I love these soooo much..the Stamp from my stash is called "Dolly Pip". I coloured her with my Promarkers and paper pieced her dress. Claire - I am so taken with those pretty sweet girls that I hope I can be excused for using one today along with elements from the new cd.....sweet or what? They are simply lovely! Just a little doodling, ribbon and a few buttons. Miria For my card I used this gorgeous stamp from Polka Doodles stashbox, Wonderland and the paper is from the matching CD. I coloured it with Promarkers and Distress; the sentiment is handwritten with Kuretake Calligraphy and the number is from All Around and Everywhere. No embellies as it is for a man. Colette - This week I have used a Magnolia stamp, coloured with Promarkers, and papers from the gorgeous Pretty Sweet CD, I think these papers go perfectly with the Magnolia images.The circle and corner dies are both Marianne Creatables and the scalloped circle is Go Kreate, ribbon, flower and pearls are from stash. Alan This card was made by using the great imagery from the 'PRETTY SWEET' cd. The hardest part was picking what digi stamp image to use. 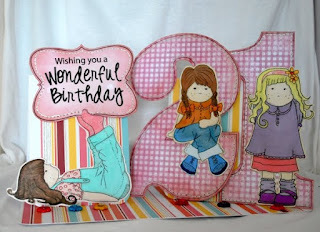 I wanted the Numbers to be a focal point on the card as well as the figures. After printing them out l backed them onto thin card to give some stability. Using my Pro-Markers l set about colouring in and had great fun doing so as they are so easy to colour no matter what your level is. Good luck with the challenge and don't forget our rules! Challenge closes on Sunday 9 October at 12noon GMT. The lovely peeps at Letraset have kindly donated a Set of their fantastic brand new Flexmarkers to us this week for one lucky winning entry! So make sure you get entering this week's challenge to be in with a chance of winning these lush pens - if you don't know about Flexmarkers 1) where have you been? and 2) check them out here. Flexmarkers are the new sister product to the Promarker and Triamarker alcohol based family of pens from Letraset and are just amazing for blending! Use them alongside your Promarkers to achieve stunning soft blends with the new flexible brush tip and a gorgeous array of brand new colours. The lucky winner will receive Set One which are the palest of pale shades perfect for skintones (brand, brand new colours and these will not be available in Promarkers). We also have another freebie download for you: Nikky has been working with Letraset to ensure that everyone is priming their Flexmarkers properly - some of the colours are so pale that until you allow them to dry it looks like the pens have no colour in them and some people don't quite prime them enough. So they put their heads together to find an easy solution and Nikky discovered if you colour these swatches in the pens are primed perfectly, so Letraset have made this into a swatch download for everyone. You can get the download here - the one you need to use to prime is on the right, 2nd row down the page: download it here. Rules of the giveaway are that you MUST follow our challenge rules - please ensure you follow the standard rules or you will not be included in the draw! The winner will be drawn at random from the entries for this week, so it doesn't matter how good you are at colouring you still have a chance of winning! The winning entry will be announced on the blog along with the challenge winner as normal. Letraset will also be running a colouring competition on their blog on Wednesday 28th September using a lovely Polkadoodles image, so head on over there to have a look and get yourself a fab free Polkadoodles download to boot - more freebie goodness! Back to this week's challenge! Hello there, Emma here to set the challenge this time. So, you can really have some fun this week scrunching, inking, tearing, sanding, infact whatever distressing technique you love, we want to see it, I hope you will join us in this 'Distress it' challenge. 4. And please no back-linking to previous posts - these will be disregarded from our top three voting.5. If you have comment moderation and word verification on your blog it really does slow us down when leaving comments - please consider turning word verification off especially now that comment moderation has a spam section. The challenge is open until Sunday 2 October at 12noon and any entries that do not follow our challenge rules will not be eligible for any prizes so please read them carefully! Daniele, for this weeks card I used the sweet stamp set called Babsie, I have used Dusty Concord and sage to distress the edges of the image which was coloured with Prisma pencils, the papers are from the new Cd called Pretty Sweet. 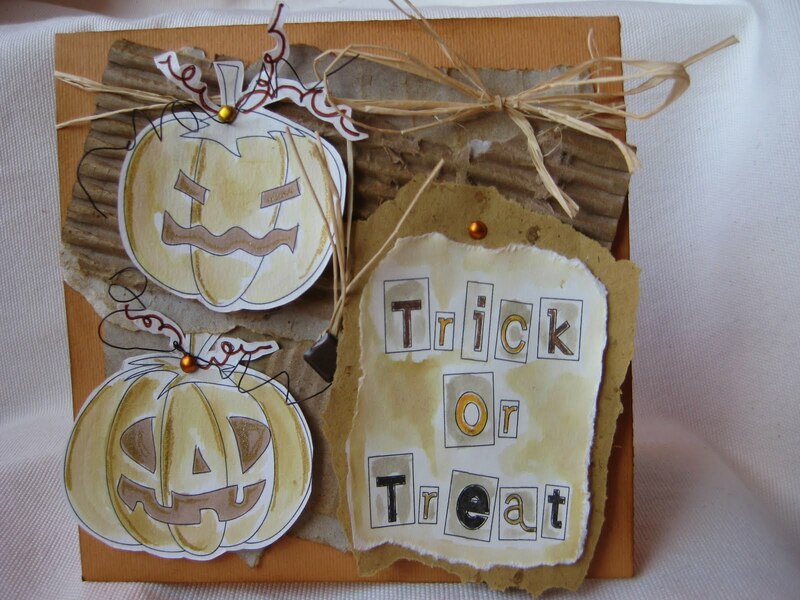 Emma - Hello there, I had fun distressing my card this week. The image and paper I used are from the Magical Winter volume one CD. I coloured this fun image with Letraset Aquamarkers. I sanded all the edges of my card and inked them, I then ripped sections to distress further and quite liked how distress finishing can still look pretty. Ruth: I've used a scrap of paper (distressed with scissors) from A Double Sprinkle of Kraft - I've printed it at A5 size for a smaller pattern. The cute mushroom house is from the Garden Neighbours rubber stamp set, and I've coloured it with Aquamarkers. Everything else is from my stash. Audrey... For this card I used the CD All Around And Everywhere. I used my S.U. cupcake punch for the cupcakes and used 3D Dots to give them dimension. For the distressing I ripped the green paper and inked everything with S.U. Chocolate Chip ink. 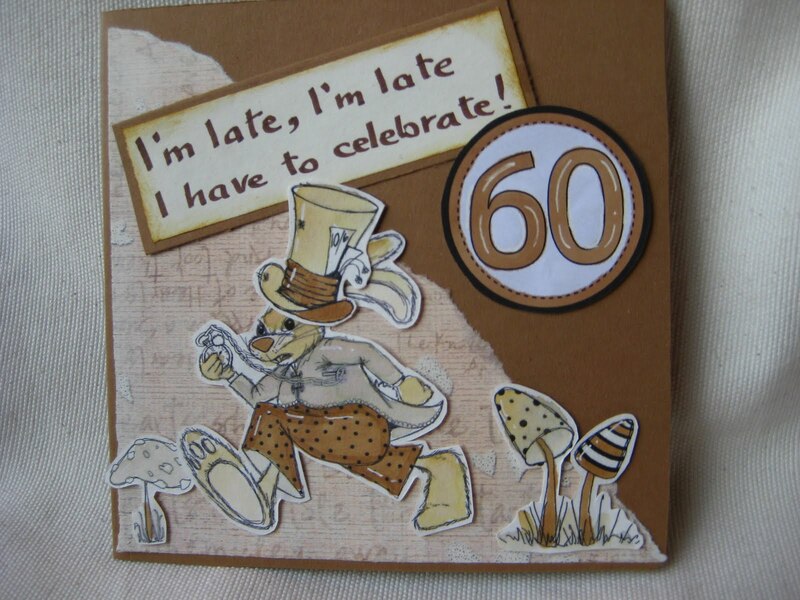 Fliss - I've made a vintage style collage card as the theme is perfect for this. I've used the gorgeous bird cage and shabby paper from the Paper Boutique Vol 3 CD. I tore the edges of the background paper and added this to a kraft card. I printed out the cage and then coloured just the scroll pattern sections on one with Promarkers. After cutting the second one I inked with Versamark and embossed with tarnished gold powder. 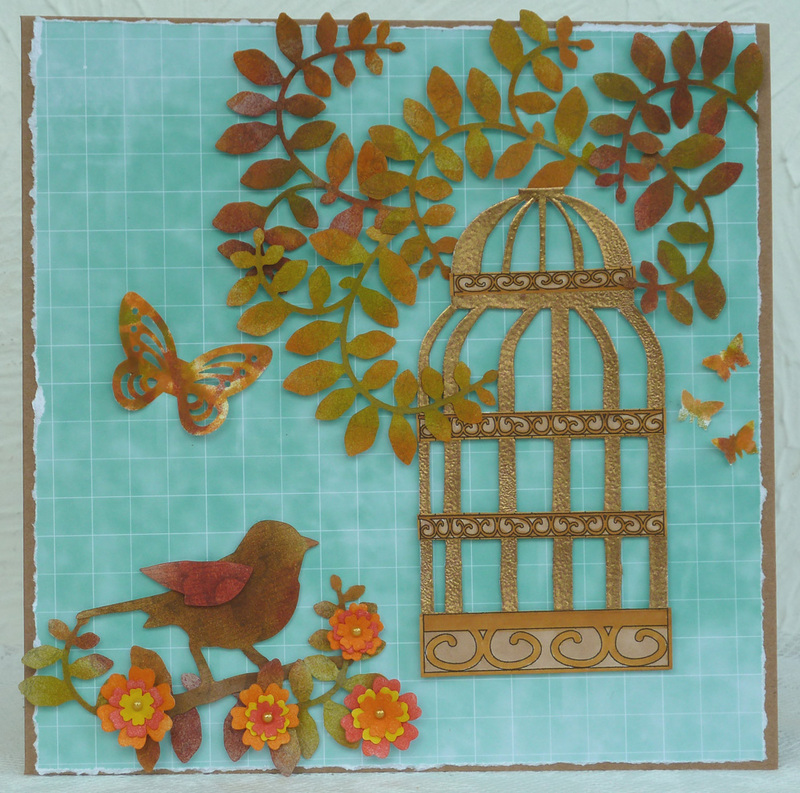 I added die cut leaves and a bird, together with punched flowers all coloured with Distress inks. I finished off with butterflies punched from the paper left after sponging the leaves as it was too good to waste! Saskia - Lots of inspiration on the Magical Winter Part 1 cd-rom! I printed out this cute birdie and coloured it with Promarkers from the Polka Doodles Shop! All papers are from this great cd-rom! I added some Glimmer Mist for the 'distress look'. Hi Louise here with my card for this week. 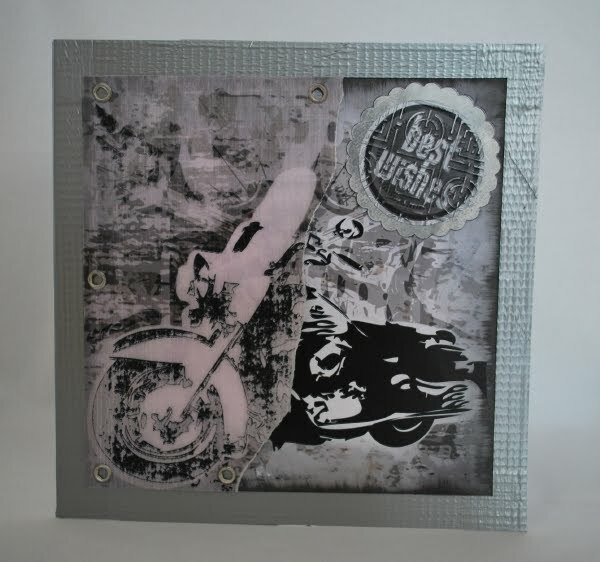 I have used the new 'Pretty Sweet' cd which is gorgeous and distressed my edges. Claire I have also used the new Pretty sweet cd to create my exploding box with lots of distressing of the beautiful papers! Diane I have used an image and paper from the wonderful Pretty Sweet CD - the sentiment is also from that CD. I'm not sure that all the distressing is very visible because I've almost completely covered it with Stickles! 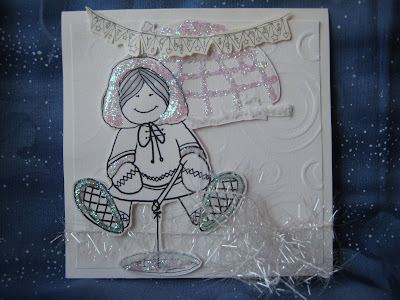 Dee: All papers and the image are from A Magical Winter CD for this weeks card. Lots of inking with a distress ink pad, tearing, sanding and water spotting. MiriaThis week I chose a Halloween preview for my distressed card. Images, coloured with Distress ink pad and Kuretake Wink of Stella, and sentiment are from versatile Sundae of Seasons. The background is recycled cardboard then I added brads, rafia and thin wire. Colette This week I have used the gorgeous Pretty Sweet CD Rom. I have sanded and inked the edges of the papers, used a Cheery Lyn die for the doily and Tim Holtz tattered florals die for the flower. The doily and flower have been scrunched and spritzed with glimmer mist and I drew faux stitching around some of the papers. Alan..... This is my 1st entry into the challenges. I have left a complete how I made the card on my blog. The Images came from Not for Girls Definitely for Men and I took the bike into photoshop and layerd two parts of the image onto each other. Then after I had printed the main image I then printed the same image onto non printable vellum. Ripped the vellum to fit. Gaffer tape was used to edge the card. Good luck with the challenge - please remember all the rules (you don't want to miss out on the Flexmarkers!) and the challenge ends on Sunday 2 October at 12noon GMT. This fabulous mini CD features 12 adorable characters which are both black and white and pre-coloured too, plus approx 150 backing papers and sentiments (yes, seriously this IS a mini CD!). You will absolutely adore this CD, everyone has fallen in love with our gorgeous girlies! Rules of the giveaway are that you MUST follow our challenge rules - please ensure you follow the standard rules (listed below) or you will not be included in the draw! The winner will be drawn at random from the entries for this week, so it doesn't matter how good you are at colouring you still have a chance of winning! The winning entry will be announced on the blog along with the challenge winner as normal. So we want to see white cards (great Christmas theme!) and only a little tiny bit of colour will be allowed. You can use as much texture, bling and glitter as you like, just remember to keep it white! The challenge is open until Sunday 25 September at 12noon and any entries that do not follow our challenge rules will not be eligible for any prizes so please read them carefully! 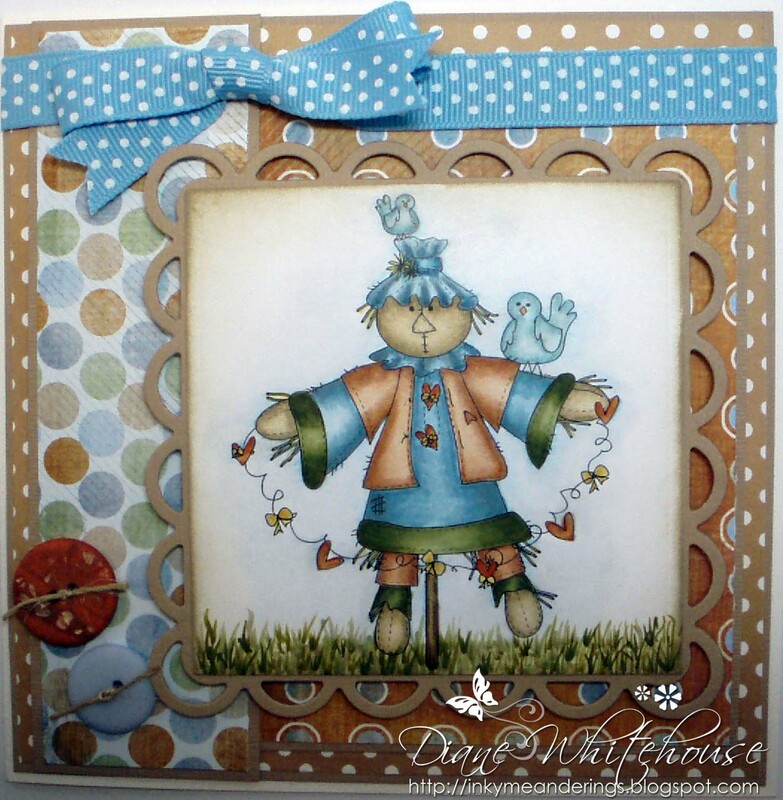 Ruth: I've used a blue themed paper and the cute snowman from Magical Winter Vol 2. I've used a fair amount of glitter glue, some glossy accents and a blue gel pen to do some dotting! Cuttlebug swiss dots embossing folder adds some texture. 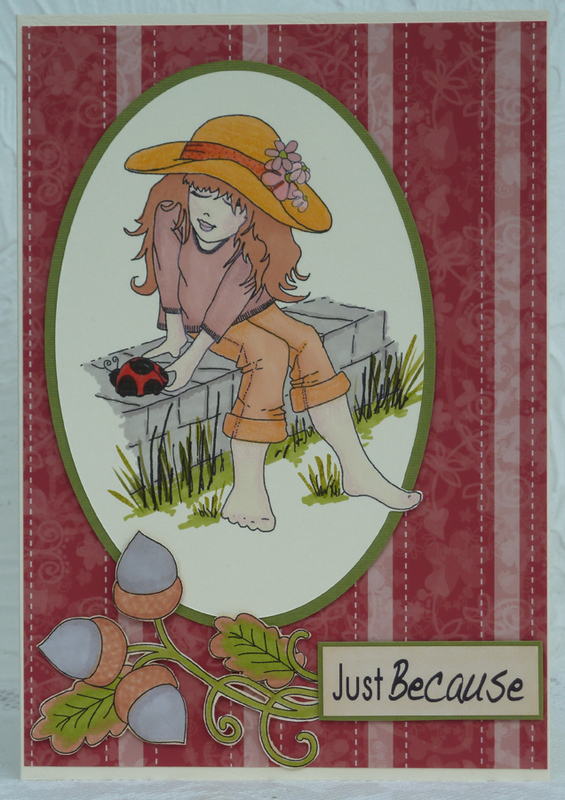 Emma - Hello there, I have created a little scene this time with Garden Neighbours stamps. I used liquid applique, Delta Snow, pearl paint and glitter glue to create the white snow scene texture. I embossed the backing paper and finally added a sentiment from the Christmas doodles stamp plate. Daniele. 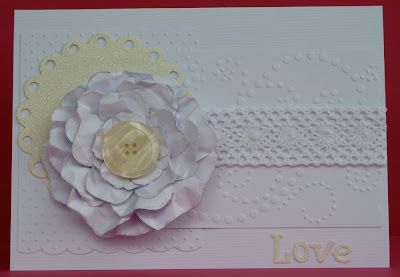 I loved doing this challenge, I used the CD called Love and Cherish for the rose paper and the stampie, which I just used Crystal and Star Dust stickles to colour. The background paper I embossed using the Damask cuttlebug embossing folder. The sentiment is also from Polka Doodles. Just added a couple of hearts, feather, lace and ribbon to finish it off. Fliss: Well, I found this one a little tricky and after much thought, decided on loads of texture for my design. I used a gorgeous sheet of flower stampies from the All Around And Everywhere CD and cut out several different layers inside the black lines. I then scrunched up the flowers and layered them up to form a rose shape. 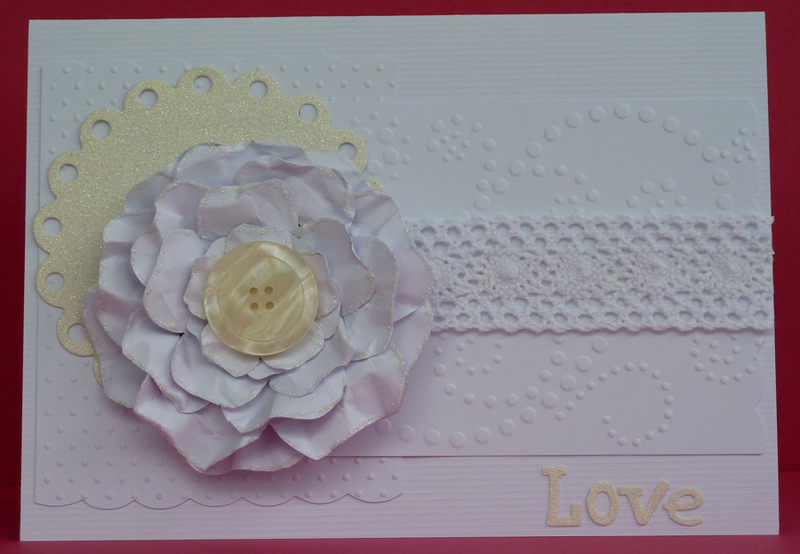 I brushed Stickles Frosted Lace glitter glue round the edges and added a pearly button to the centre. I made up the card with several embossed layers, a glitter card lace circle, some crunchy crochet lace and die cut letters. Lis-m..This was a tricky one for me.. no colour..? I used the Smashing Snowman from Magical Winter 2, and Various layers of card, some embossed, some die cut, and a few punched snowflakes.. and gems and glitter and glitter pen..! Miria This week's theme is very challenging but I found what I needed on Magical Winter part two: I just stamped the black and white image and sentiment and added some glitter and flower soft to give dimension.Some white tinsel was the final touch. The background paper is embossed with a crimper. Colette I loved the theme this week, and really enjoyed making this card, I used lots of dies, an embossing folder, a snowflake image from Magical Winter 1 CD, gems pearls, ribbon and lots and lots of glamour dust. 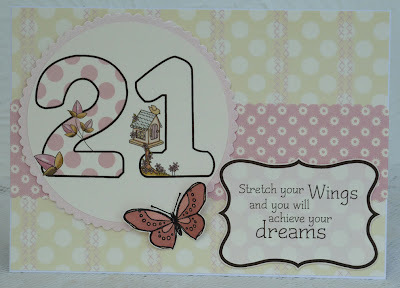 Dee: I decided to use the one of the Flutterfly Fairies stamps for my card this week. I embossed some vellum and stamped on vellum for the greeting and the wings, added a die cut shape and swirls and Bobs your Uncle a completed card. Good luck with the challenge and don't forget our rules! Challenge is open until Sunday 25 September at 12noon GMT. We want to see a scene in your creation and I think its got the Design Team in a festive frame of mind! If you want more detail on how the Design Team have created their projects, just click on their name and you'll be taken to their blog. Closing date for the challenge is Sunday 18 September at 12noon GMT. 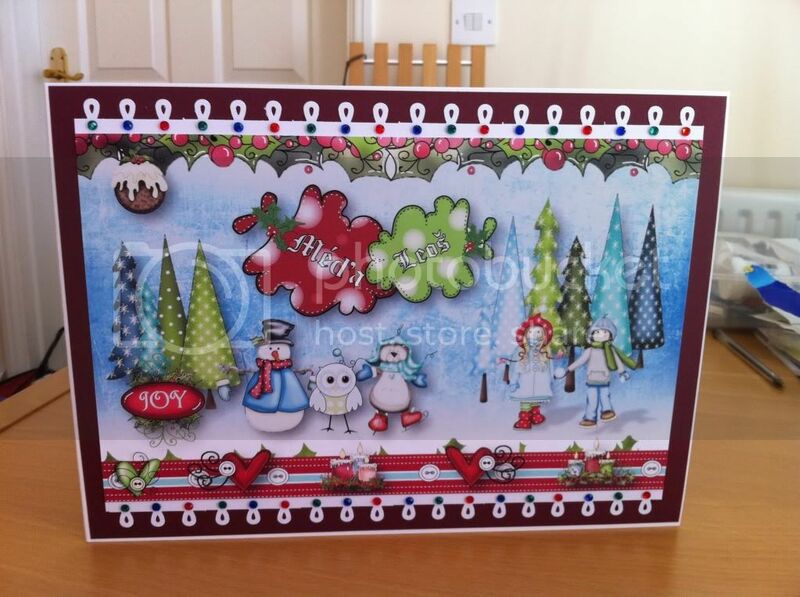 Ruth: For some reason I've never used this template before from Paper Boutique Vol 2 - Creative Christmas. So here it is! I chopped the card down as I only wanted the fireplace bit on it. A bit of sparkly stuff in the fire with all the elements layered with foam pads and the card is complete! Daniele, ohhhhh I've had a play with some of the scene stamps from Polka Doodles, the set I used is called Garden Neighbours and they now come in clear which makes it so much more easier I think for masking and layering up these cuties. The sentiment and flowers are also stamps. I coloured the image with Prisma Pencils,and layered up the trees and roof for added dimension. The papers are from the CD Sundae of SeasonsI've used lots of Stardust stickles for bling......so love my glitter! Emma Hello there, I used the very gorgeous Garden Neighbours stamp plate to create my little scene and added a few Doodle Dewdrops to embellish. Fliss - I've decided to share one of my Magical Winter CD set Christmas cards which is a tent style card with Santa's workshop on show at the back. 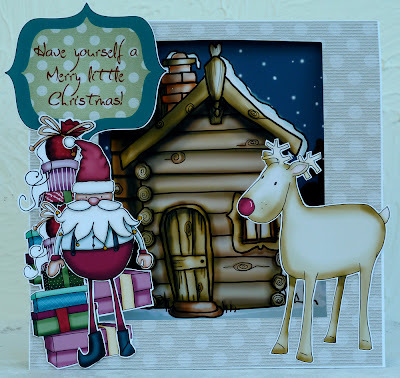 The card was made using one of the lovely papers from the CD set and has a cut out Santa, red nosed reindeer and a pile of presents to decorate the outer frame edges together with one of the lovely sentiment panels. 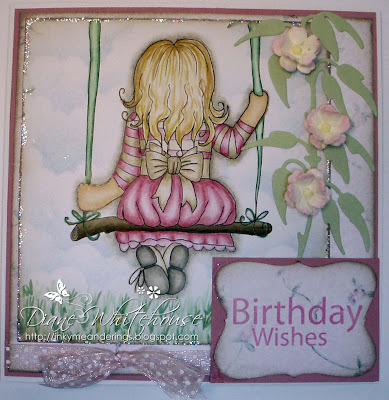 Claire - I decided to try a bit of Mixed media ( full description on my blog) using stamps from the Daisy doodles and neighbours range. A first try of my Bind it all to create a notebook....played and played - great fun! Louise For my card this week I have used the Magical Winter Cd and printed out the background in colour but the Bear and log in black and white so I could do some colouring and then I have gone a bit crazy with glitter for a wintery look. Josie: This was my first time using the Magical Winter CD Rom and I absolutely loved it!! I has such fun looking through them. The striped and dotted paper is from the cd rom as is the digi image. I coloured this using Pro Markers and Flexi Markers. I added Cosmic Shimmer Glitter for the effect of snow. For the snowflake, I printed the snow flake images from the cd rom. I turned the paper over and on a light box went over the shape with a glue pen. I added the cosmic shimmer glitter and then covered in glossy accents. When dried I cut it out. MiriaThis week I'm back to gorgeous Magical Winter part one for paper and elf image, the tree is from Christmas fun clear stamps, all of them coloured with Promarkers. I added some glitter and flower soft as a final touch. Colette I have made up a little scene using elements from both Magical Winter part 1 and Magical Winter part 2, and covered it with a Hunky Dory snow globe filled with beads, snowflake sequins and glittery stuff. I made a scalloped frame using paper from same CD's and attached the whole thing to a rocker card, again using paper from the CD's. The snowflake is made from a mix of Marianne Creatables snowflake dies, covered in glamour dust, a silver punched snowflake and a gem added to the centre. Good luck with the challenge! Deadline for entries is Sunday 18 September at 12noon GMT. Hi, folks. Welcome to Polka Doodles! Miria's here, this week's challenge is up to me and I've chosen "Autumn Leaves" as a theme. Maybe it's a little bit early to think about this season. Summer is not over yet, especially here in Italy where I live but you don't need to choose an autumn subject, you can do it if you like it or you can just use autumn leaves colours - orange, green, brown or even gold. Have a look at my teamies' gorgeous creations below and you'll surely be inspired! If you want more detail on how the Design Team have created their projects, just click on their name and you'll be taken to their blog. Closing date for the challenge is Sunday 11 September at 12noon GMT. Miria I made a twisted easel-card. I've chosen this cute scarecrow from Sundae of Seasons, coloured it with Promarkers and Distress, the papers and the leaves are from the same CD. The sentiment is handmade with Kureatake Zig Calligraphy. I added buttons and rafia from stash. Ruth: I've made a simple layered autumn wreath by cutting out lots of individual leaves from Sundae of Seasons. All the leaves have been added with glue or foam pads to add extra depth. 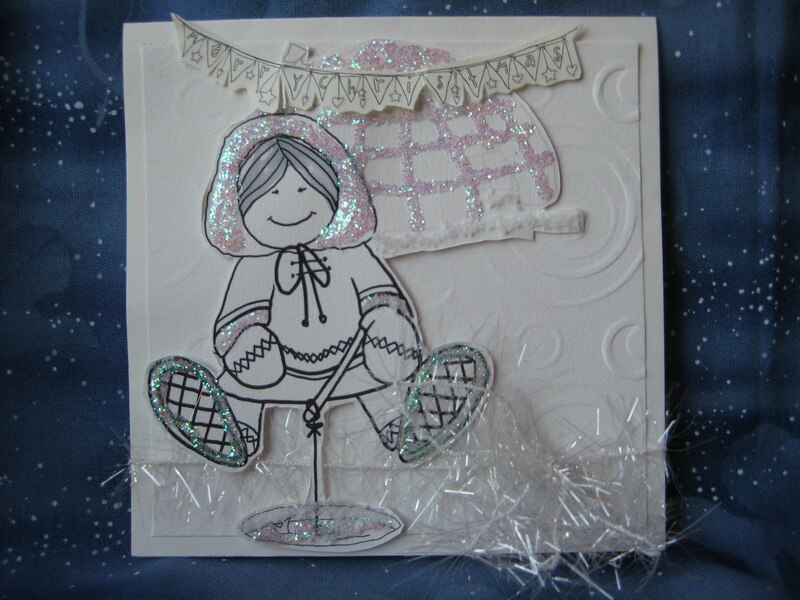 Emma - hello there, I have used papers and a gorgeous image from Magical Winter Part One Cd Rom to create my card this time. I coloured the image with Letraset Aquamarkers. 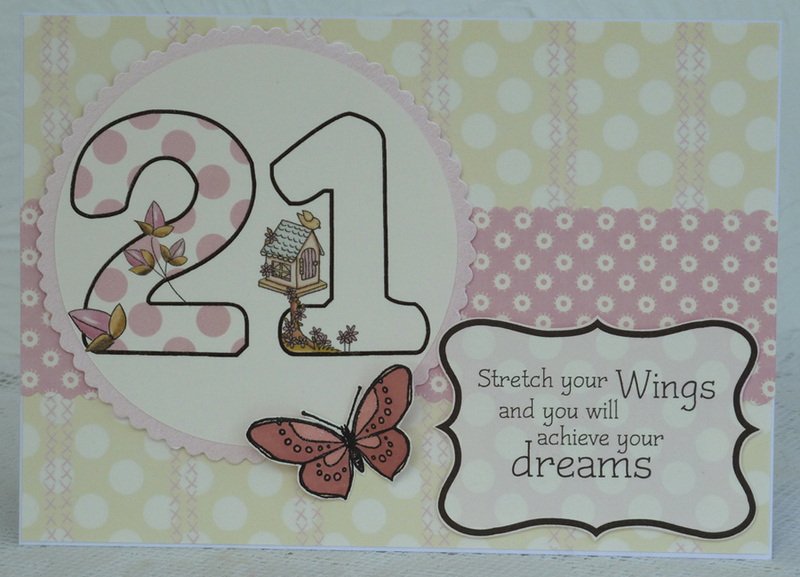 The sentiment is from the Fairy Flutterby stamps. Fliss: I really enjoyed this challenge as I'm an Autumn girl at heart and my creation was inspired by the stunning colours of turning leaves. I've coloured the sweet girl from the A Double Sprinkle Of Kraft CD with a mix of Promarkers and Prisma pencils and then cut the image with an oval cutter and added a green mat. I used a gorgeous ribbon paper from the Sundae Of Seasons CD and acorns from the Autumn section which I coloured with Promarkers. 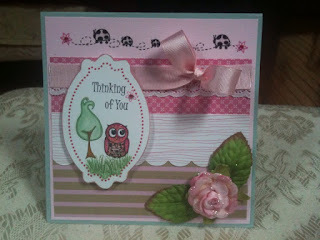 I finished off with a greeting from the Sensational Sentiments stamp set. 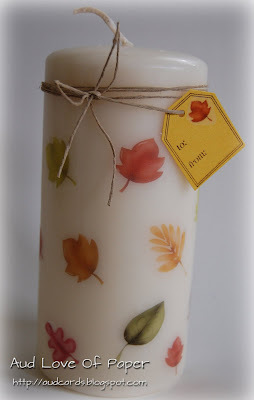 Audrey... For this Autumn candle I used the CD All Around And Everywhere. I printed out the leaves on Safmat and I used my S.U. punch and stamp for the tag. I thought this would be the perfect hostess gift for Thanksgiving. Hi Daniele here with this weeks challenge, I took the title literally and used lots of leaves to create this wreath, I was going to colour them all but decided to print and cut them out instead as I have used quite a few, I used the CD Sundaes of Seasons for the images, papers and borders, I used a die for the matching buttons and added doodled stitching to the edges.The sentiment and stitched circle is from the set of stamps called Stamp Doodles Sentiments. Dee: I made my card using images and papers from a Sundae of seasons CD this week. A few buttons, crochet thread and ink finish off this quick project. 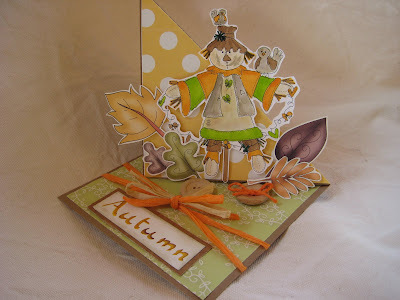 Hello from me Louise and my card this week as an Autumn feel there is definetly a change in the weather here. For my card I have used the young lady from Magical winter part one and teamed her with leaves from the Sundae of seasons Cd the sentiment is from this fab set here. Colette I have made an easel card using one of the girl images from Magical Winter CD1, I've re-coloured her to make her more Autumnal, the wall is made from paper on the Not For Girls CD and everything else comes from Sundae of Seasons, I have layered up the sunflowers, the girl and the bird, and added some orange glitter, I wanted something more coppery, but this was all I had. I have also decoupaged the buttons on the sentiment and then covered them with glossy accents. This is Diane saying 'Hi' to you all and showing you my sample for this week's challenge, which focuses on the colours of Autumn. I've used the scarecrow image from the Sundae of Seasons CD and the base layer of polka dot paper is also from that CD. I hope you like it! Claire: Had great fun getting inky with this one. Used A Sundae of Seasons to create my autumnal tag along with some triple embossing and some flowersoft. Lou: Something different from me this week as I have made 2 canvases using the colours from Autumn as my focus which are based upon our family visit to the Guinness factory. Being Irish, you could say it has become a bit of a pilgrimage!! All background papers are from the "Not for Girls" CD as there is a fabulous selection of bazzill inspired papers on there. I have miniturised some of the sentiment papers and then using Safmat created collage effects with words and photos of us all. Everything of course mat and layered onto that fab paper design. Lots of torn edges and no embellishments either! Good luck with the challenge - you have until 12noon GMT to enter on Sunday 11 September.